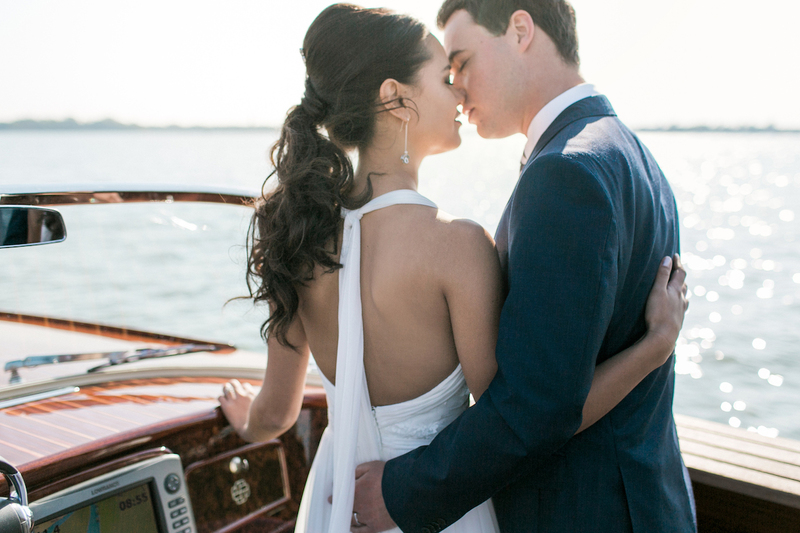 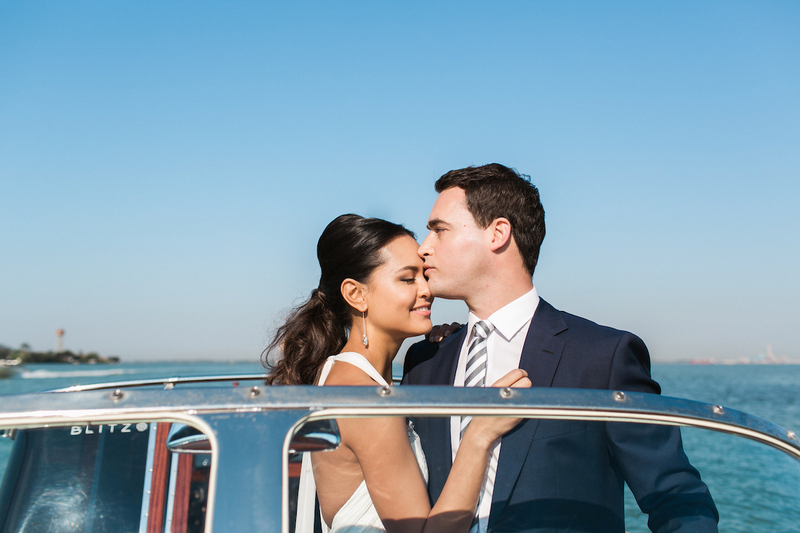 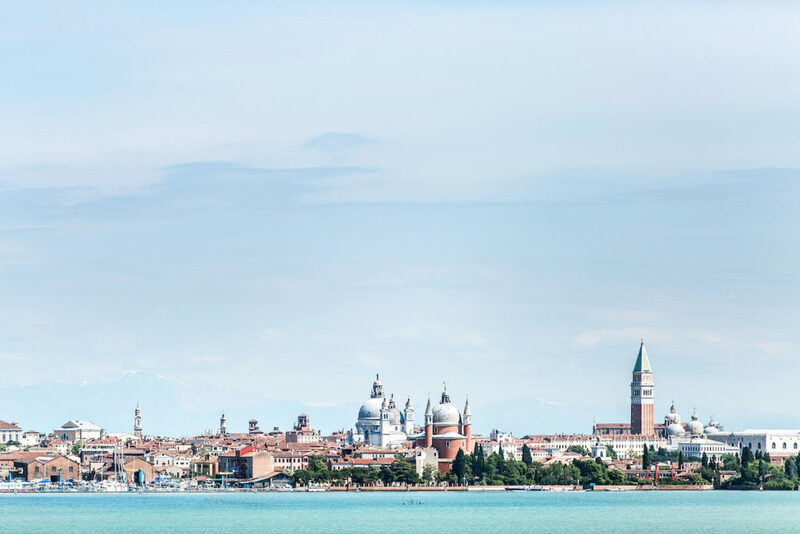 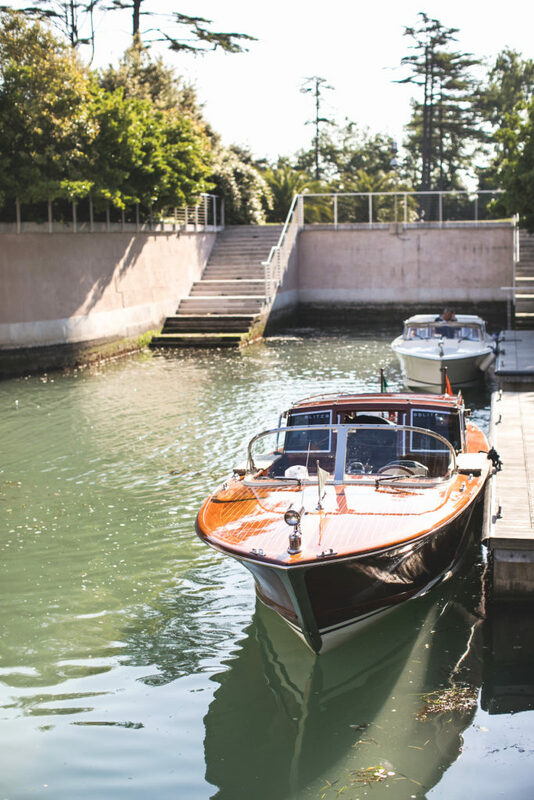 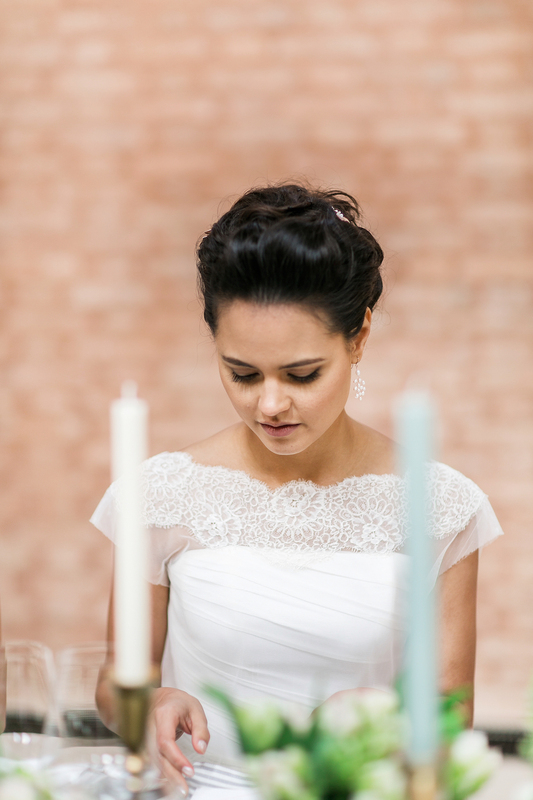 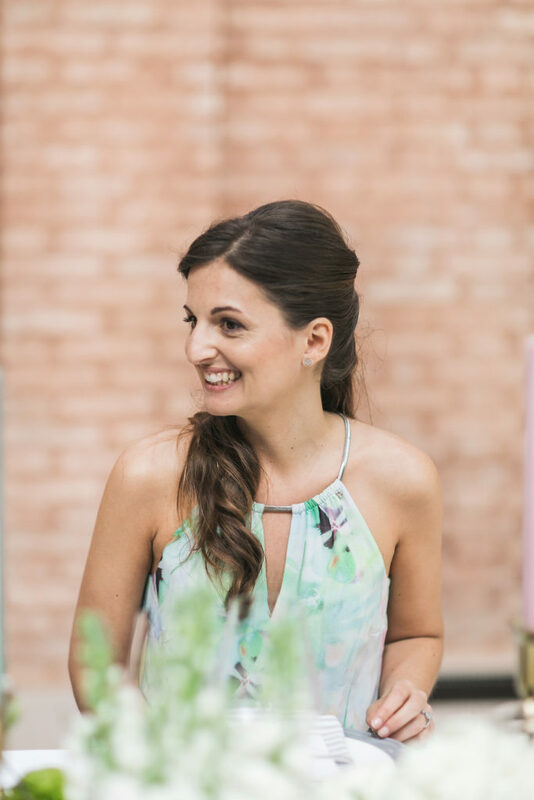 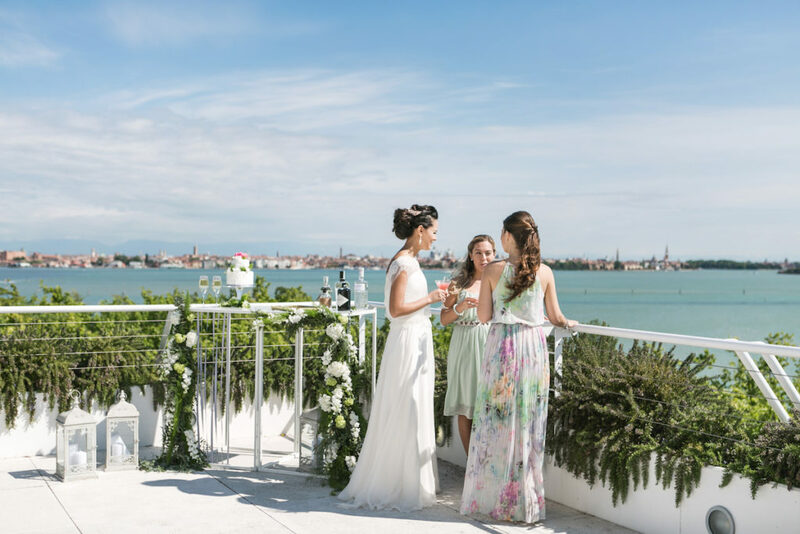 The ultimate dream of passionate travellers with a romantic soul – a Venice elopement on a private island followed by an intimate couple shoot in the heart of beautiful Venezia. 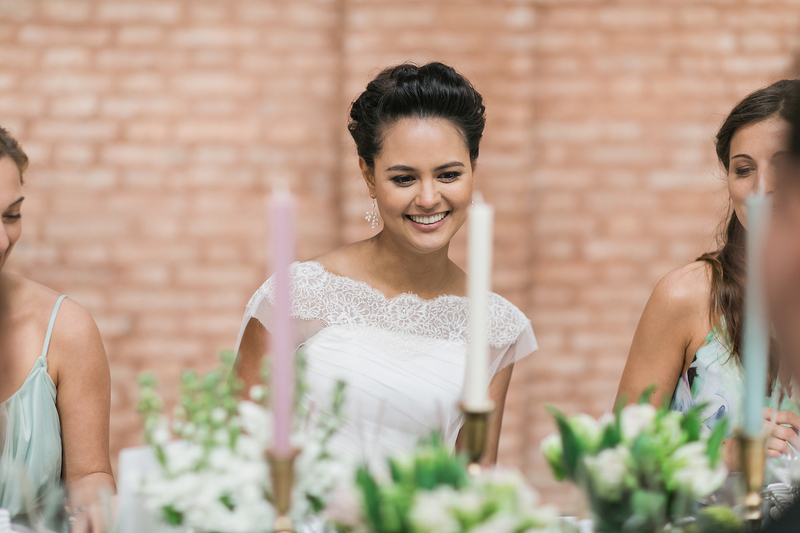 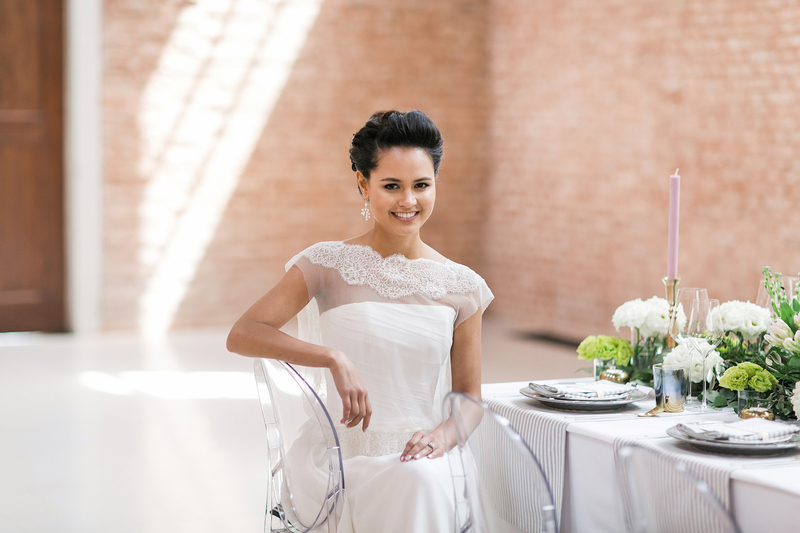 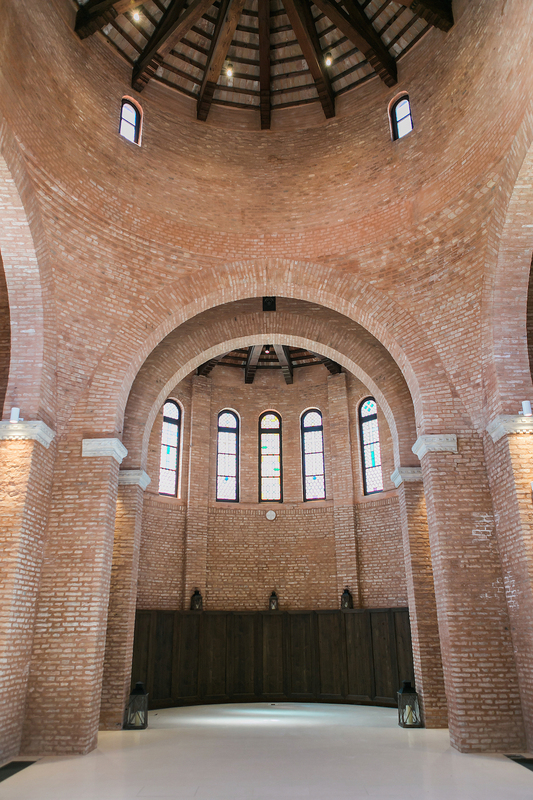 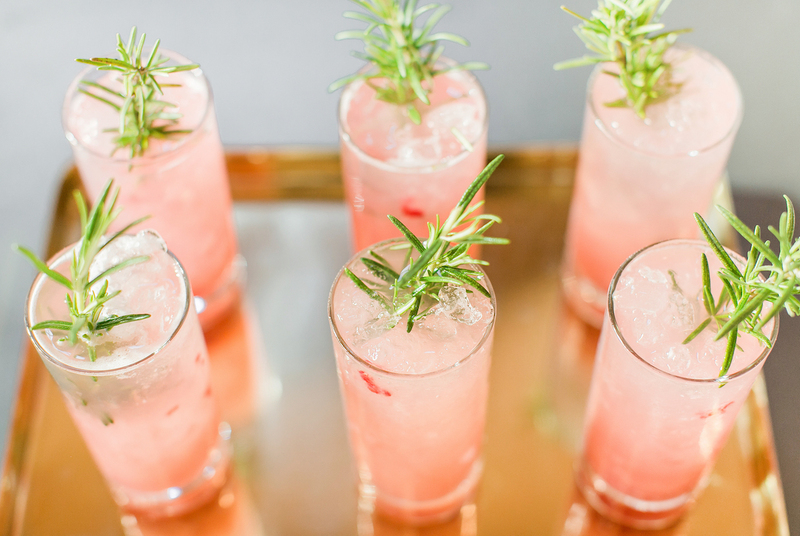 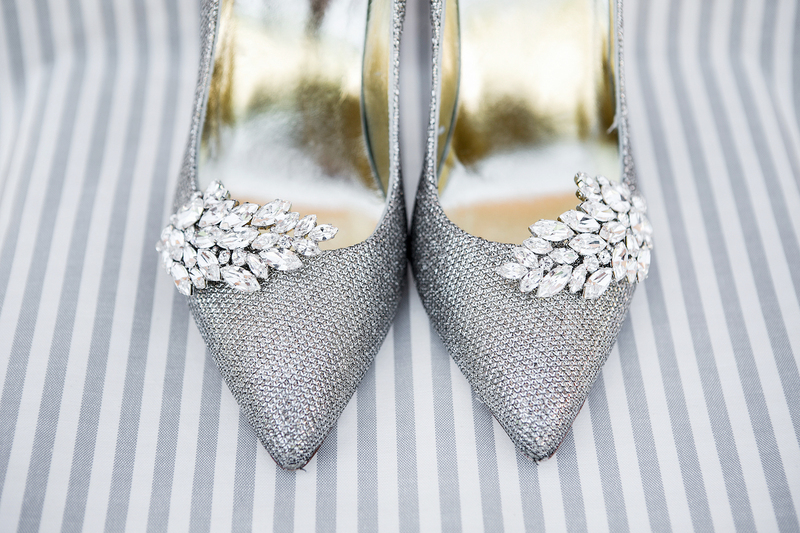 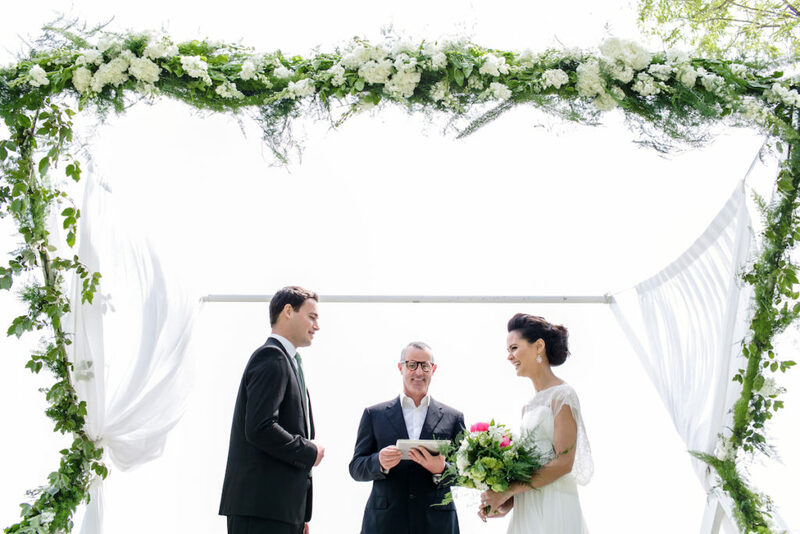 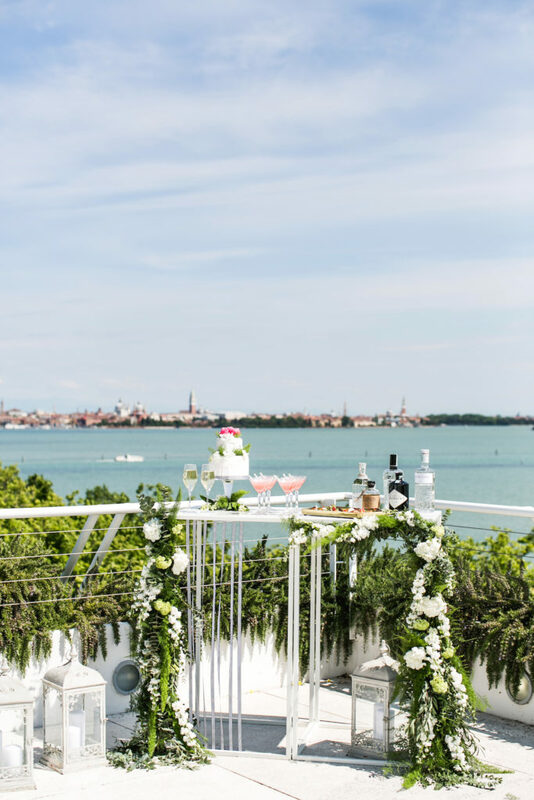 The style of this elopement is a contemporary luxury take on the traditional Venice wedding – no oxblood red, carnival masks, or overly-ornate details! 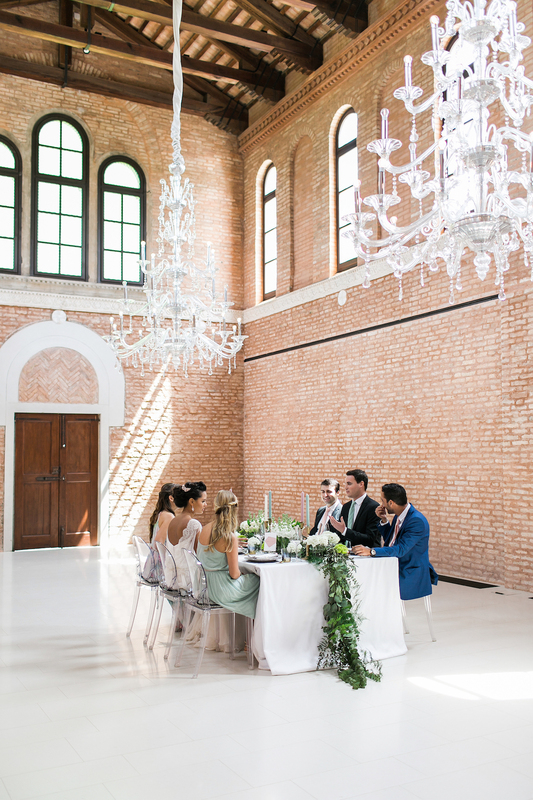 The idea was to bring to life the muted version of Venetian intricate architectural lines, the rich colours of buildings and canals, as well as the traditional gondoliers’ stripes (one of Venice most recognisable elements) – a perfect combination for today’s modern brides and grooms. 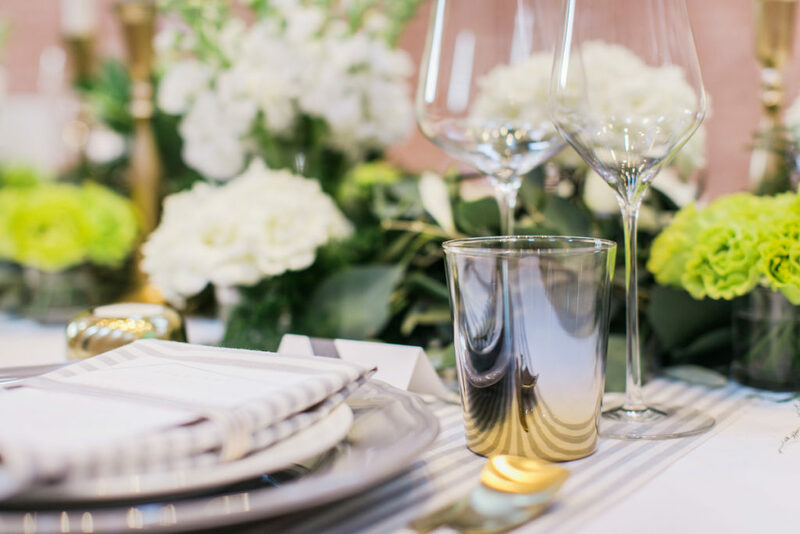 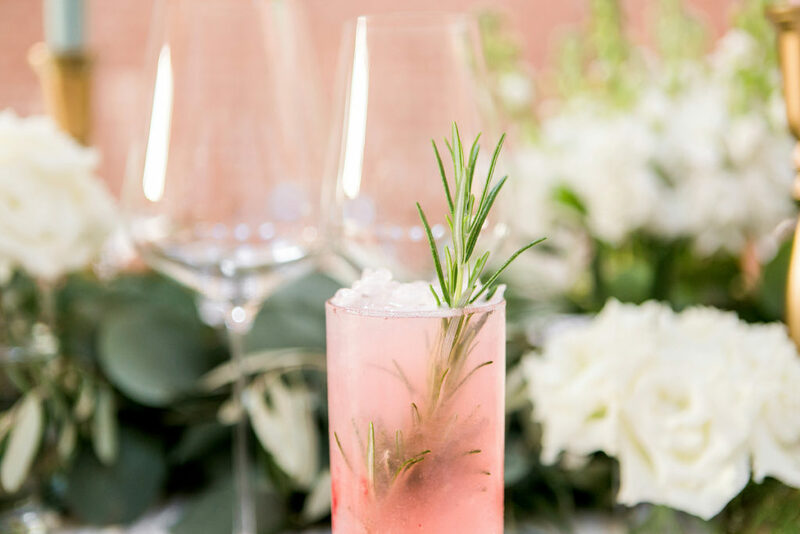 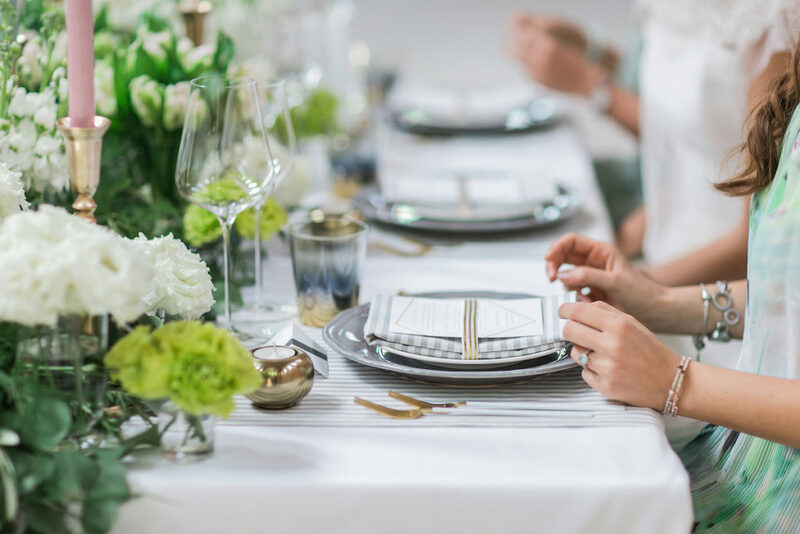 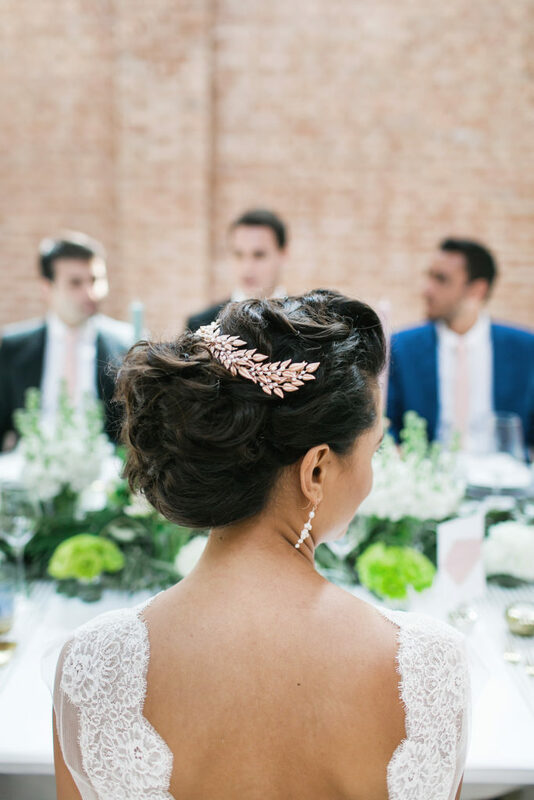 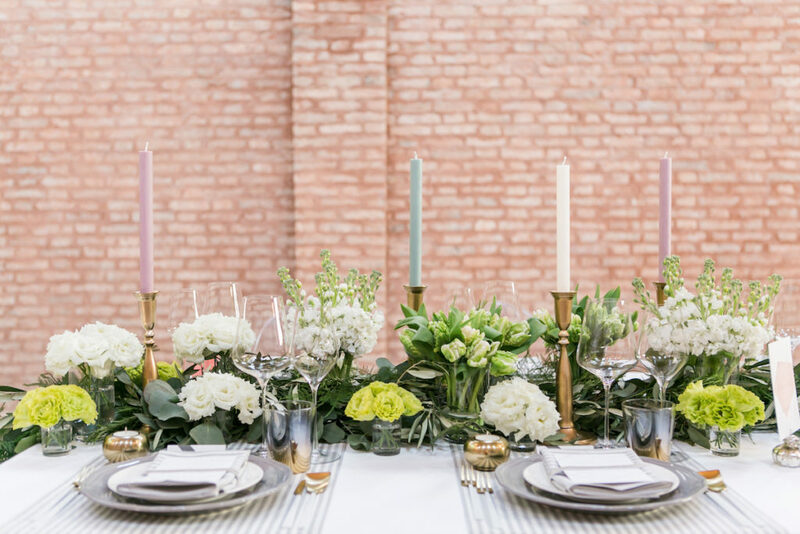 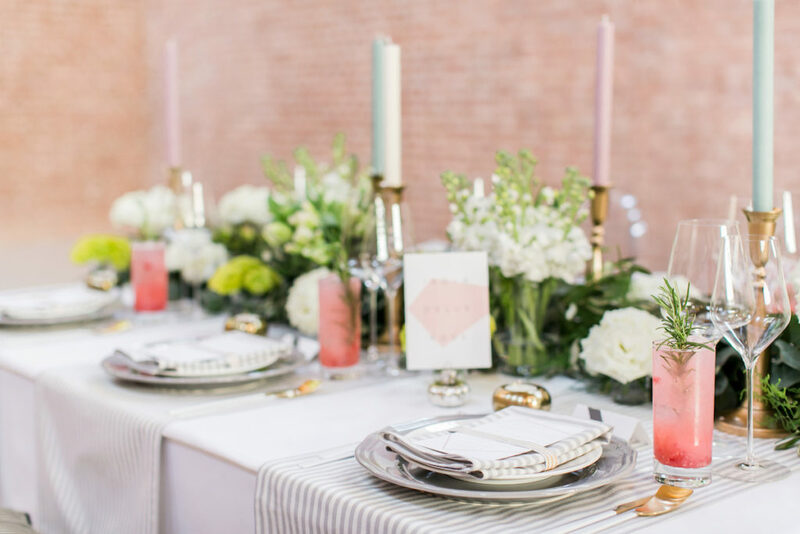 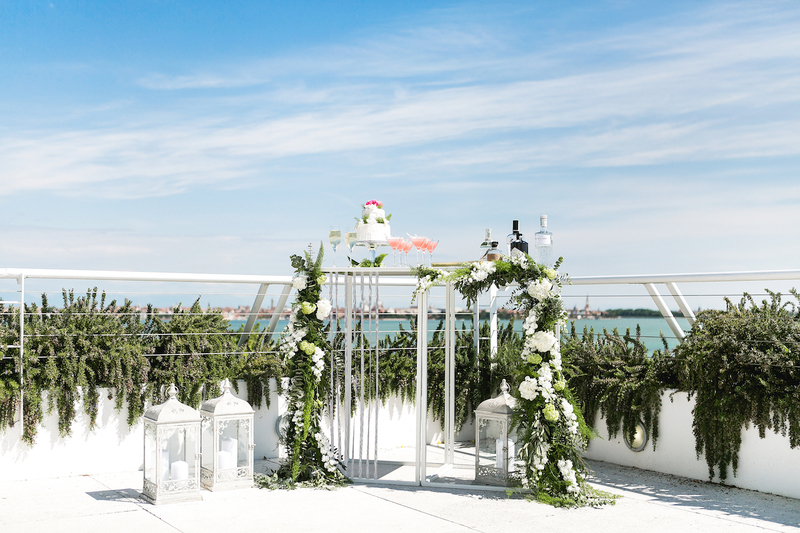 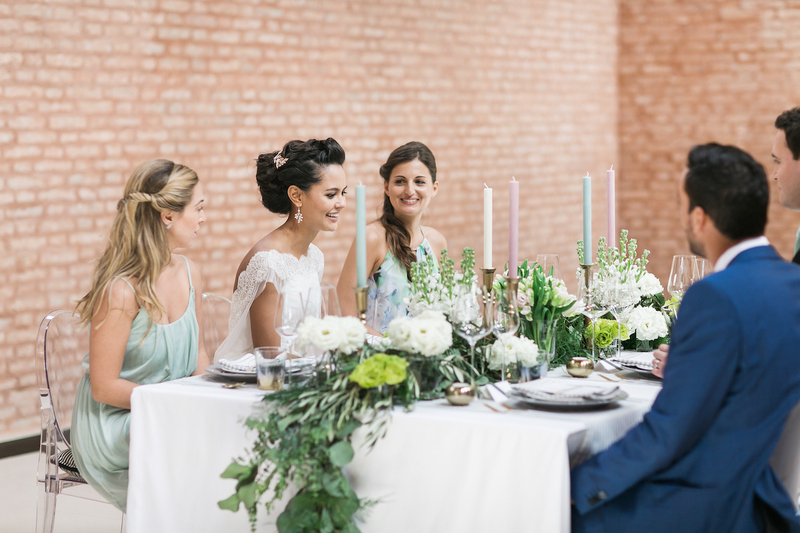 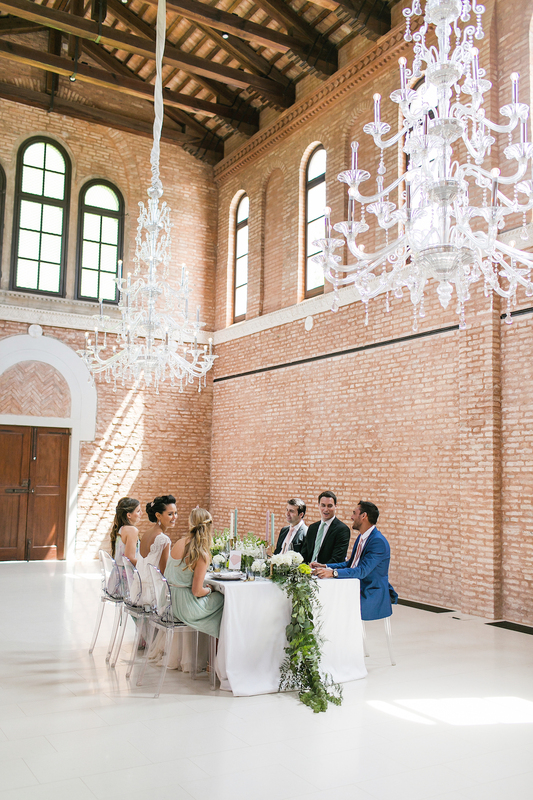 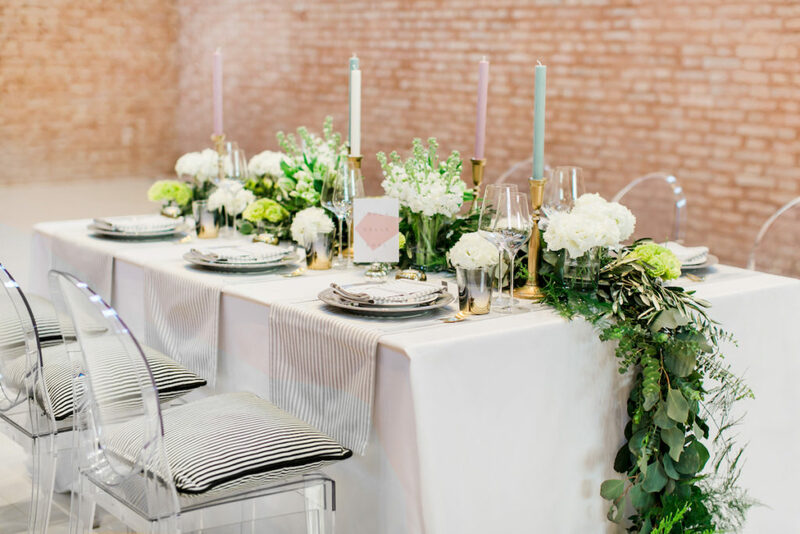 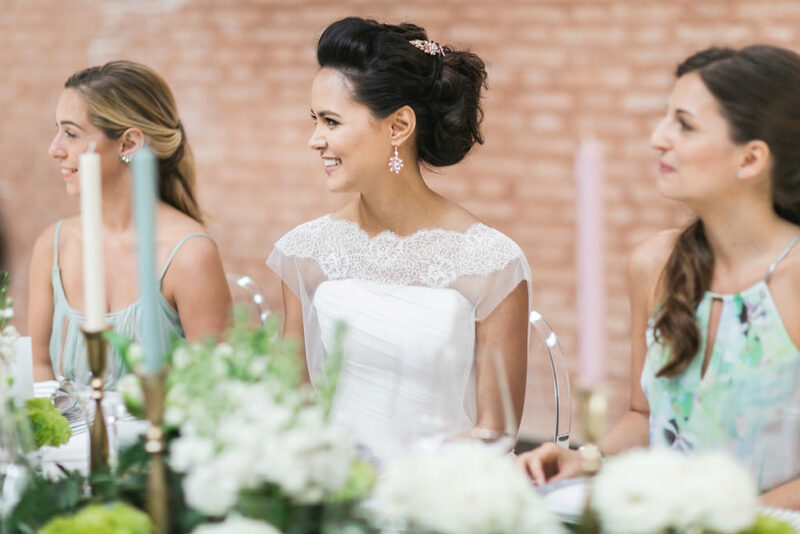 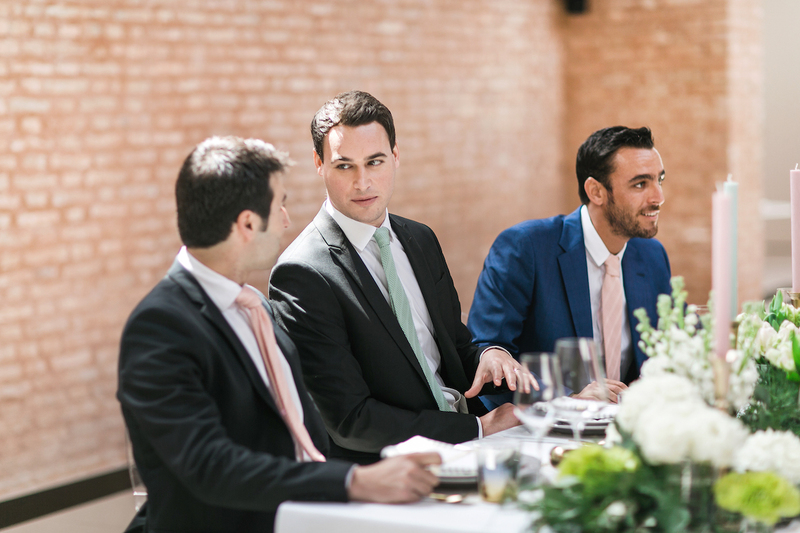 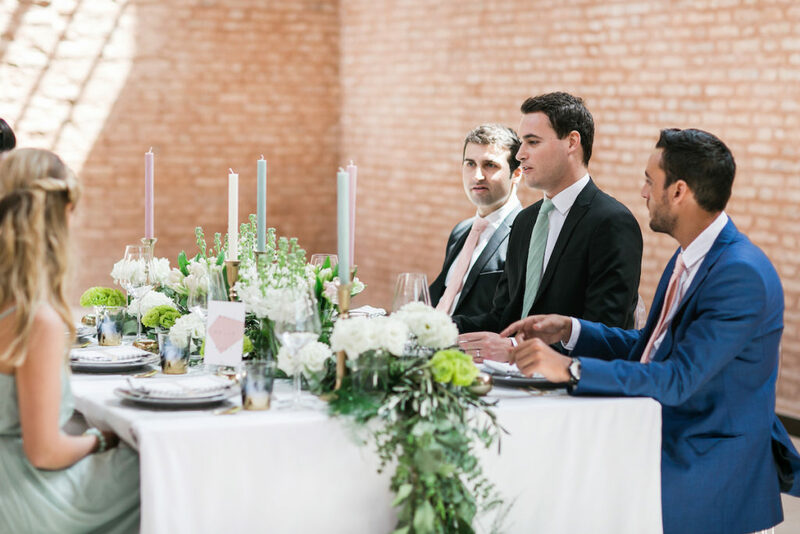 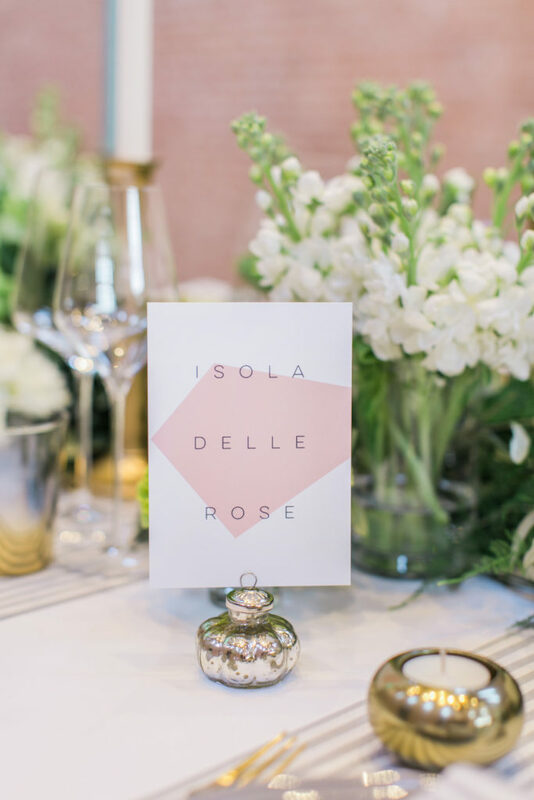 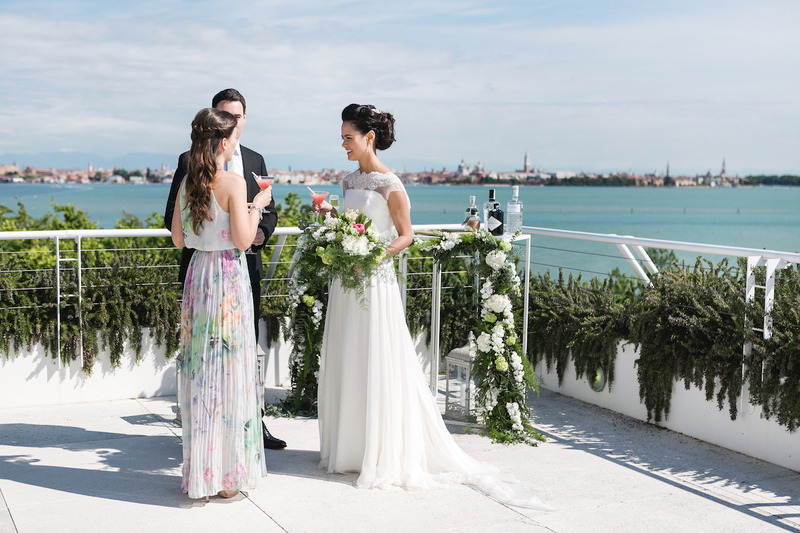 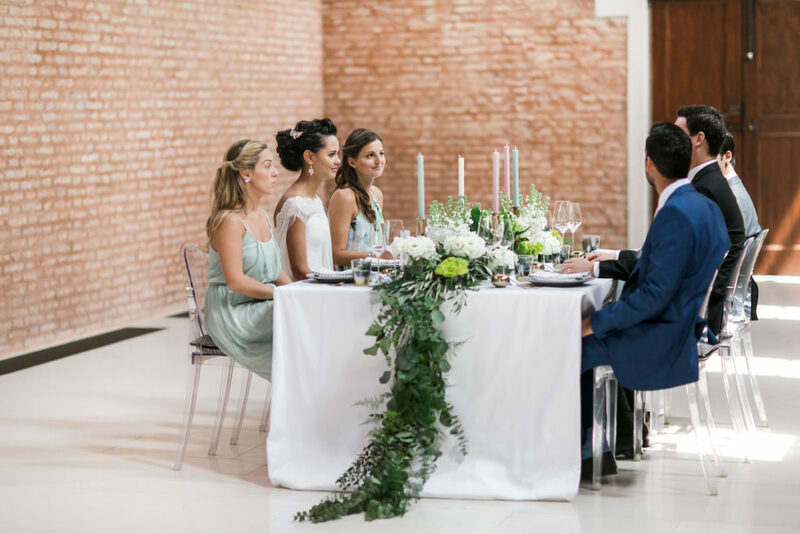 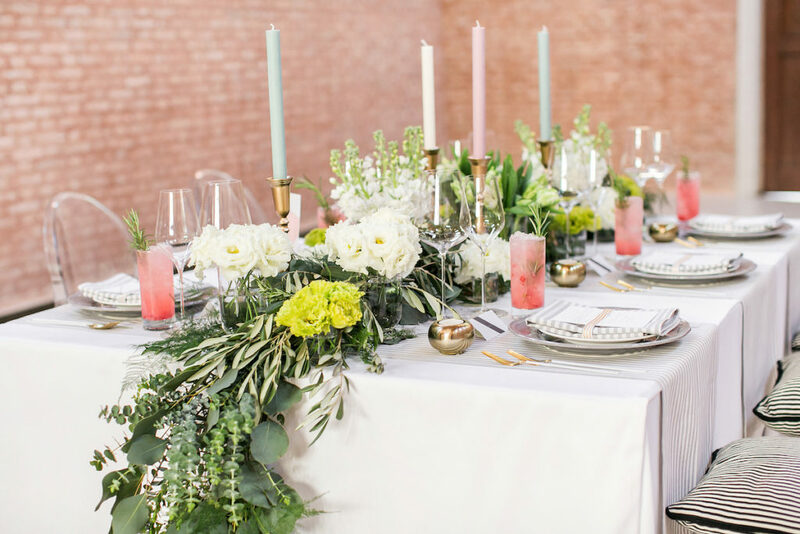 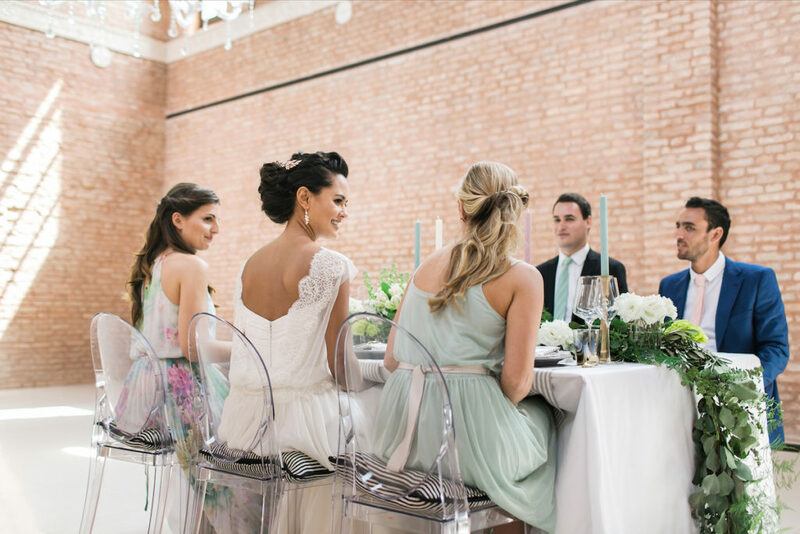 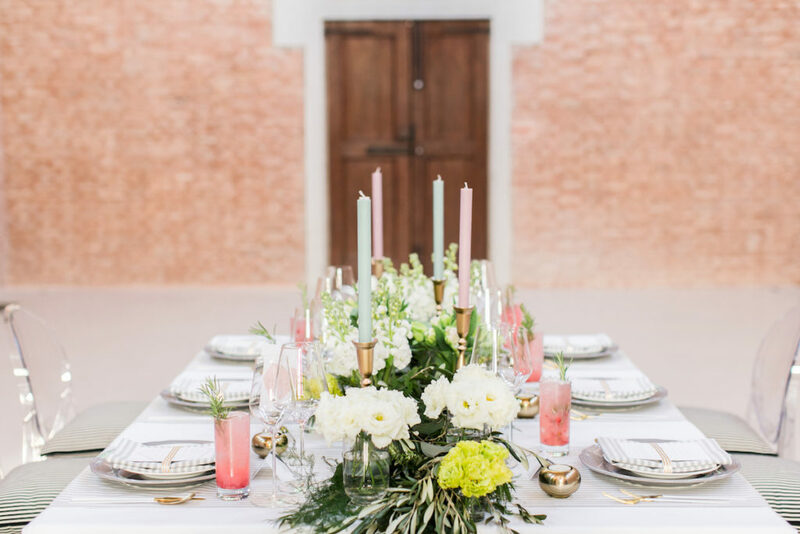 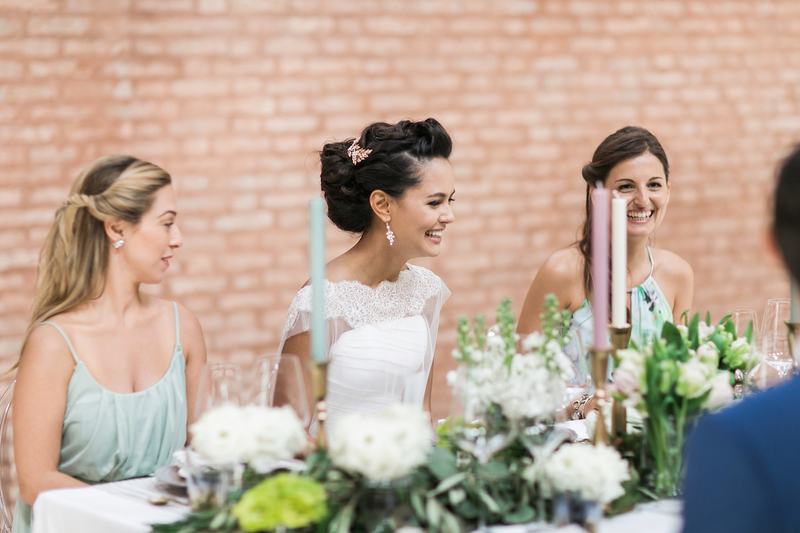 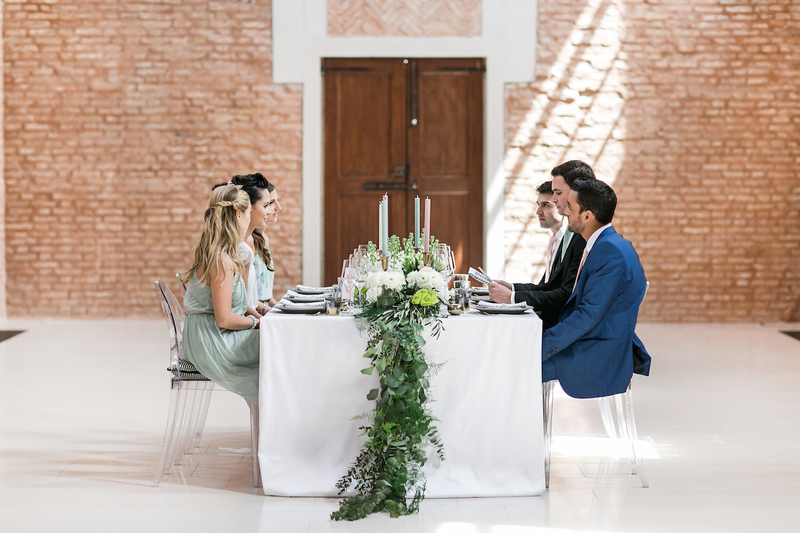 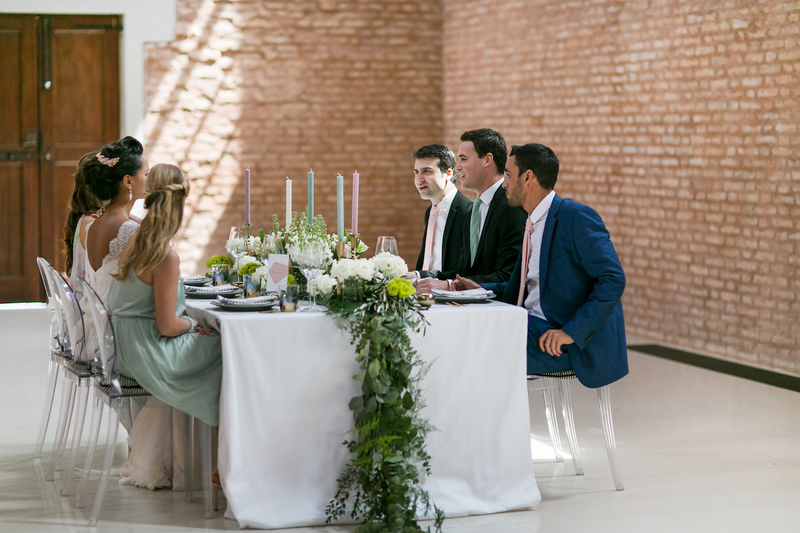 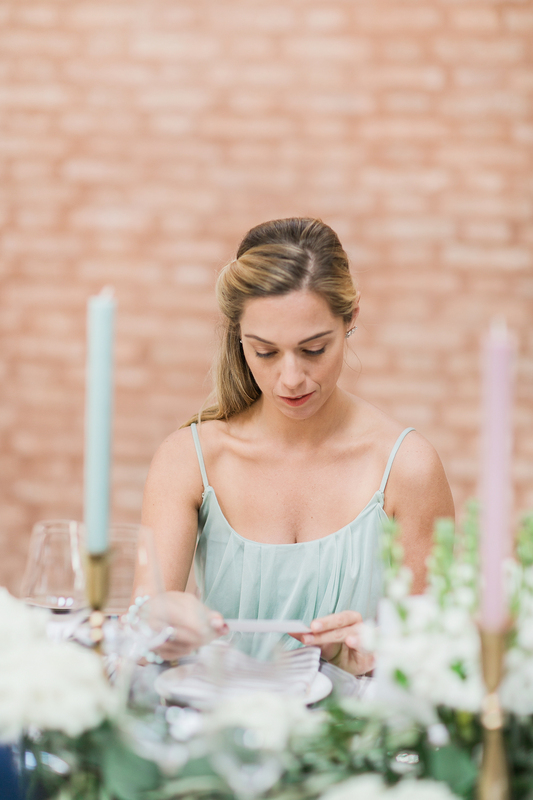 We took the rich colours of Venice and gave them a muted twist: mint and antique pink on a white base, with grey stripes and splashes of gold – a fundamental element for an elegant, intimate wedding in such an effortlessly opulent city. 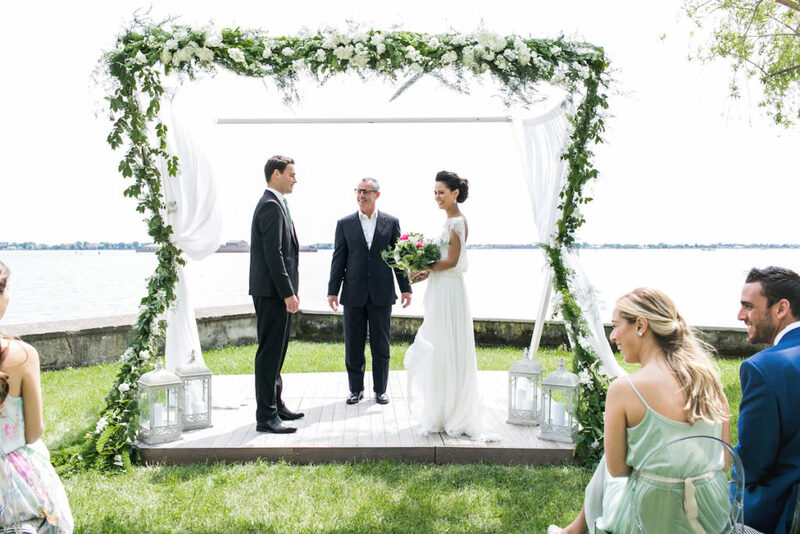 To continue on this “romantic meets modern” theme, Connie went for two bridal looks – with dresses by Couture Hayez, accessories by Kelly Spence and Freya Rose, and the help of hair and makeup artists Susy Zancanaro and Roberta Galesso, we went for a soft, romantic look for the ceremony & reception, contrasted by a much more modern & sassy look for the couple’s intimate portrait session in Venice. 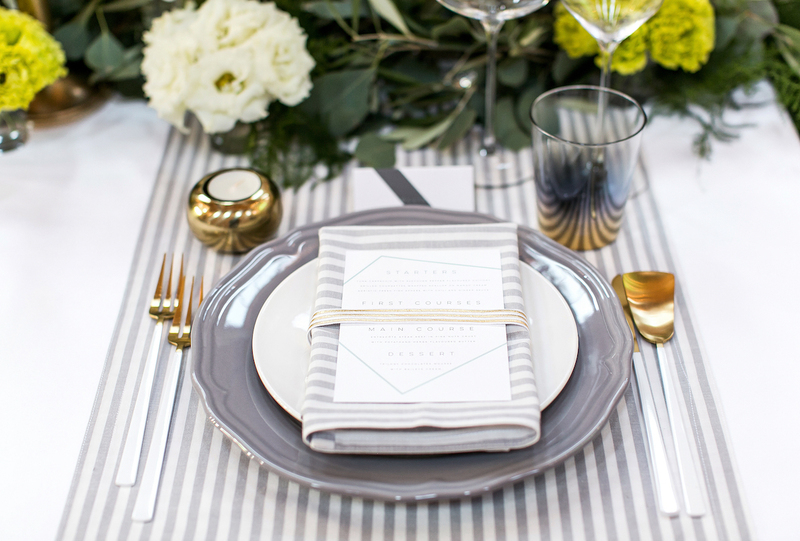 Stationery played a huge part in bringing this look to life. 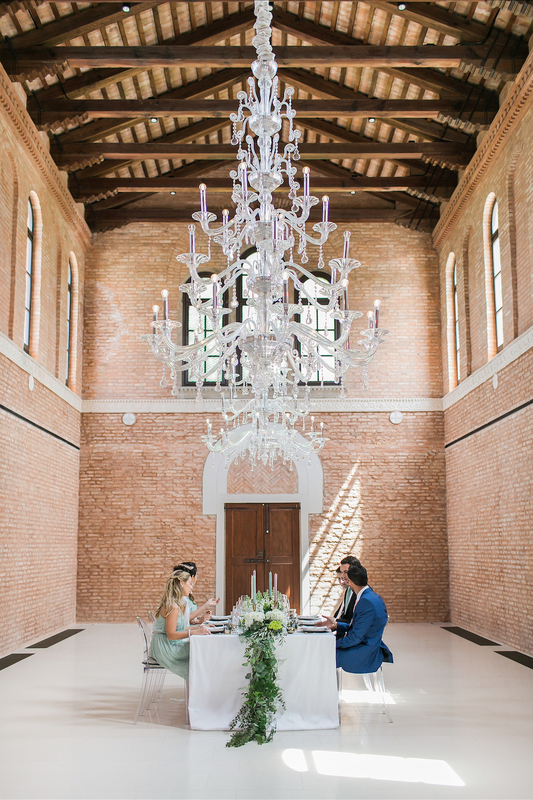 Eighth and Autumn were briefed to inject all of the paper goods with a linear version of the traditional intricate architectural lines of Venice, as well as finding a way to incorporate the gondoliere’s stripes. 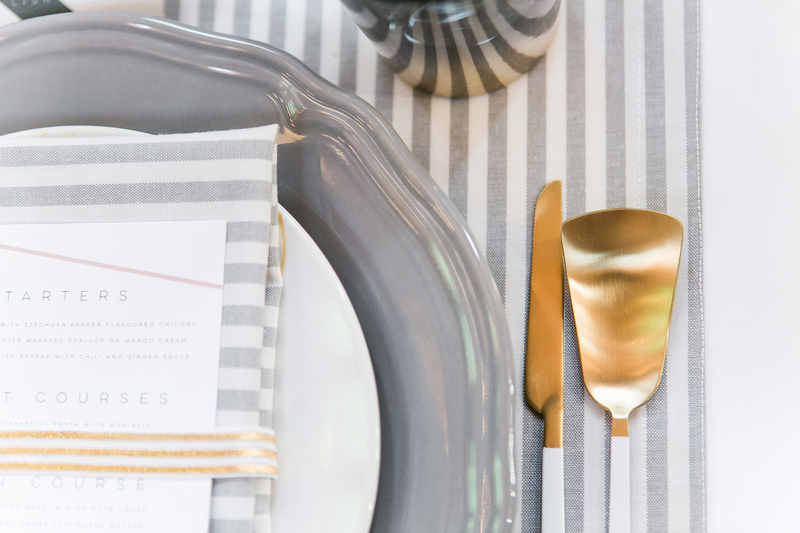 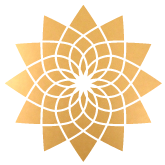 This element was then enriched by striped gold & white ribbons which we used to wrap the menus. 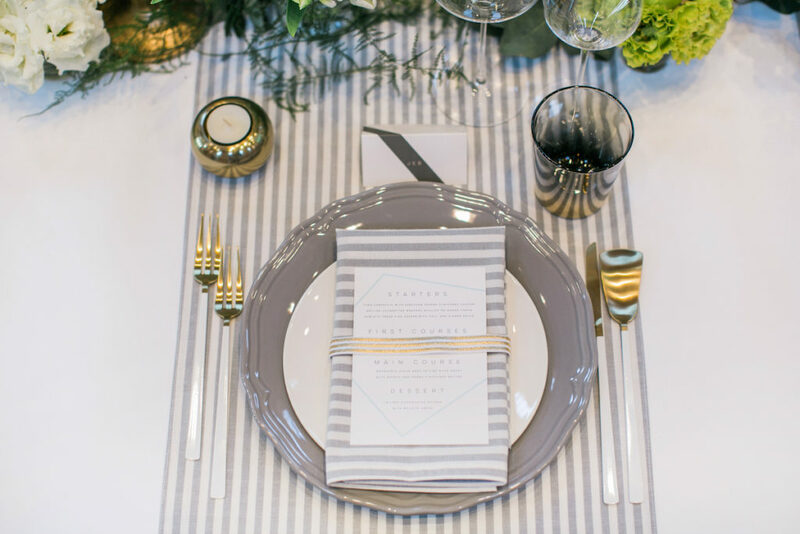 Table to Dine For added that little touch of modernity to our intimate reception table by providing striped grey & white table runners and napkins. 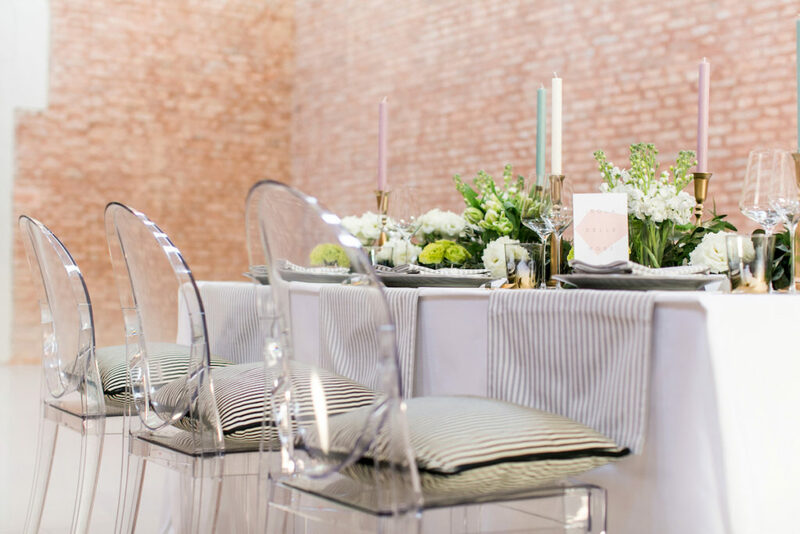 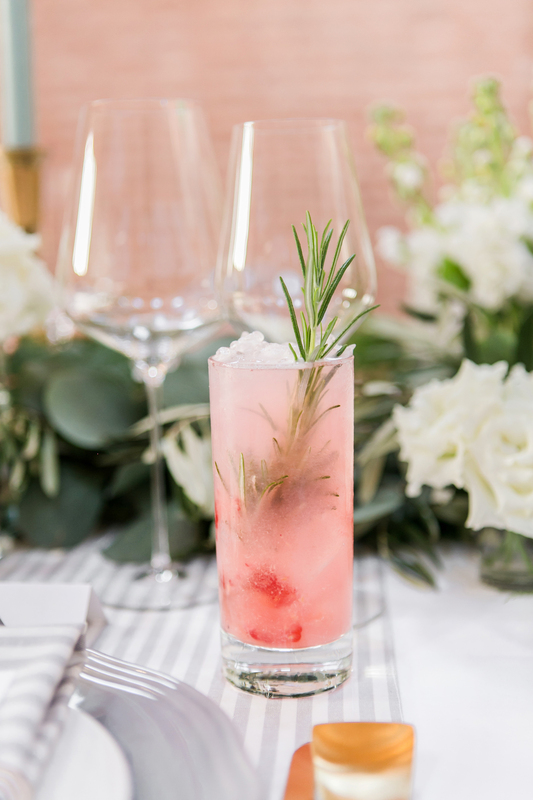 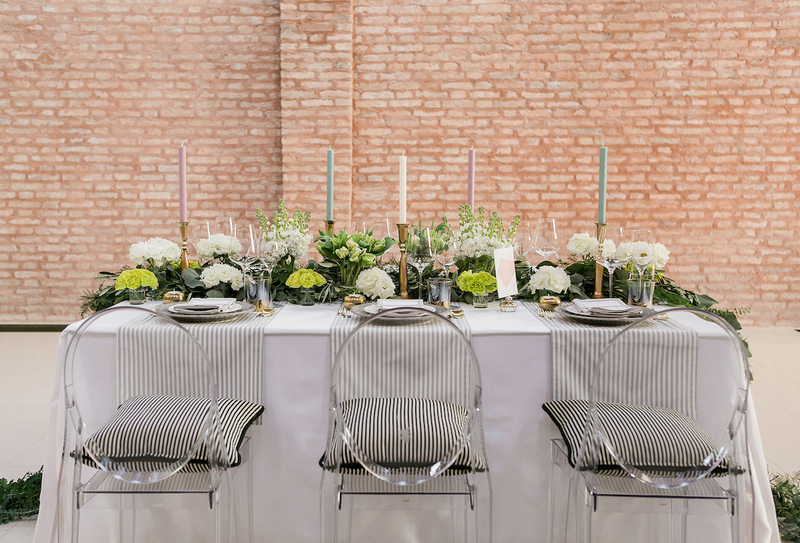 The subtle grey is key to ensuring this striped look doesn’t visually clutter the aesthetic of the table – a key concept for a less-is-more couple and something that is carried through simple, modern touches like ghost chairs and the “skeleton” bar structure provided by Your Event Venice. 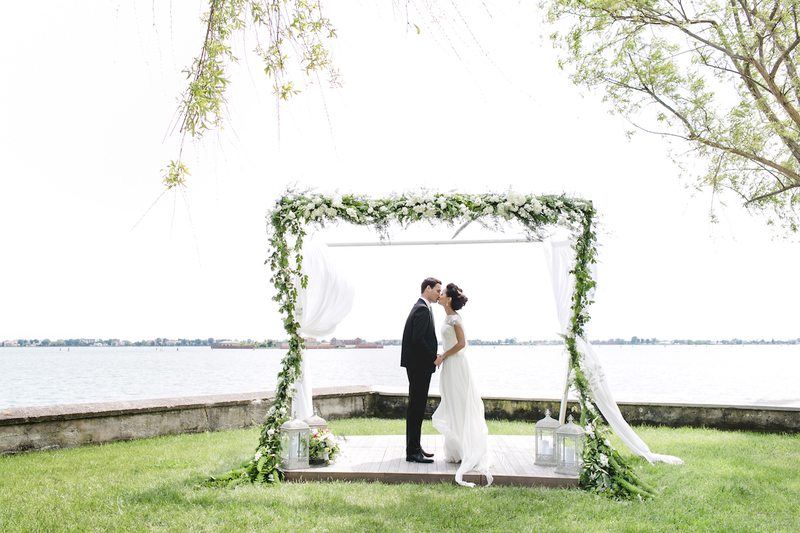 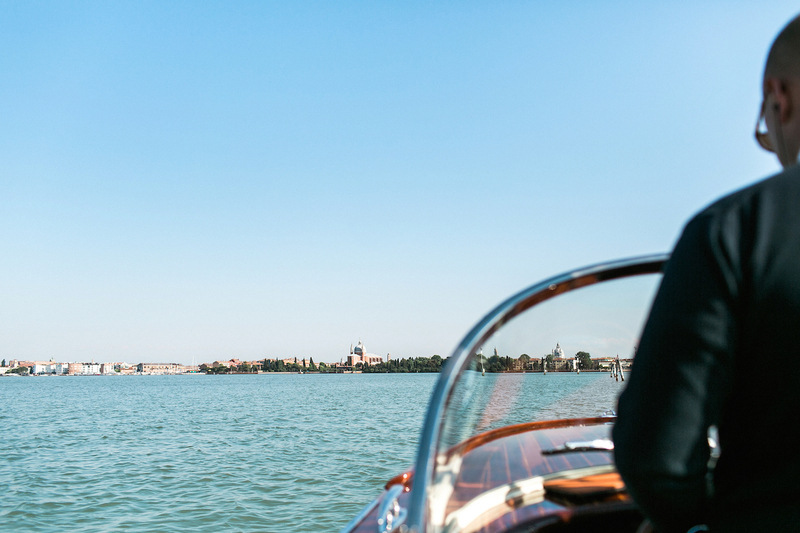 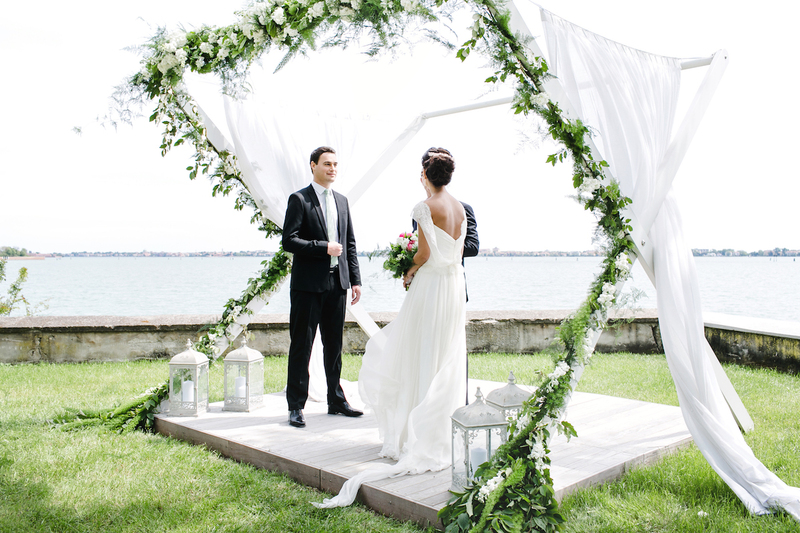 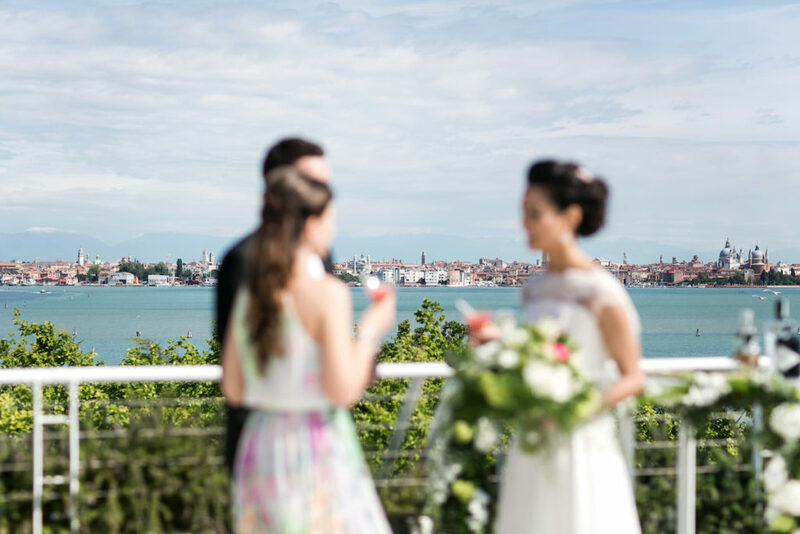 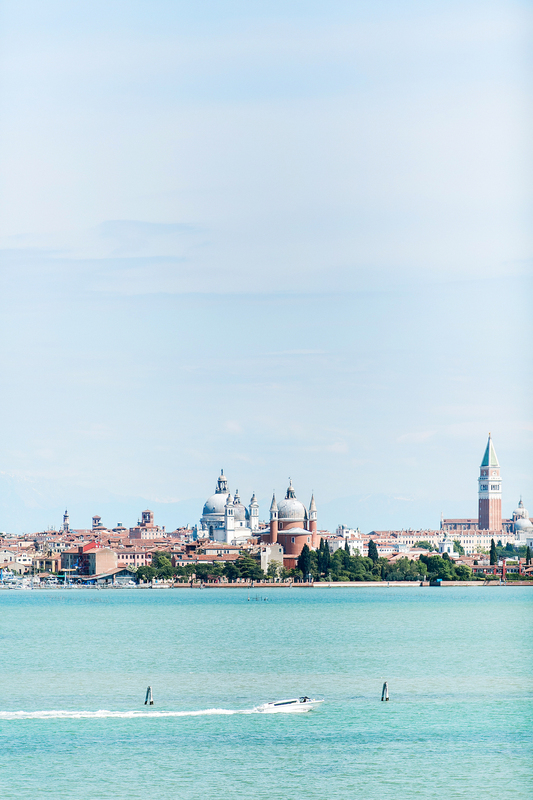 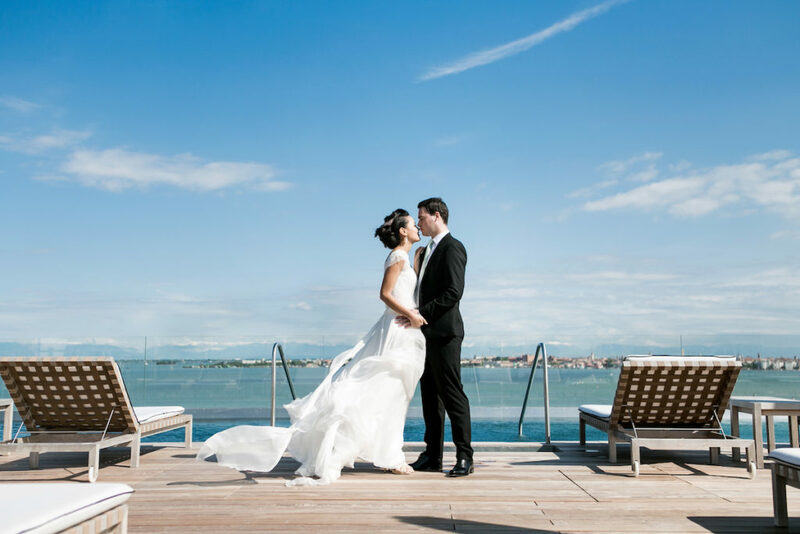 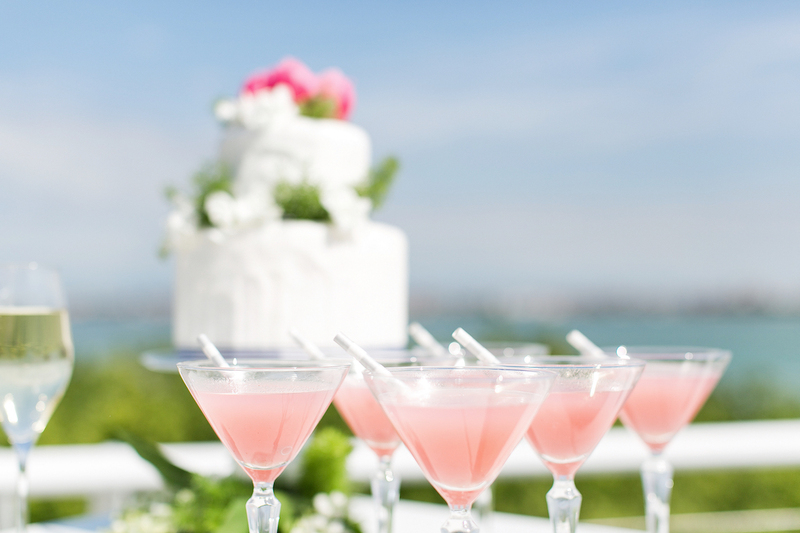 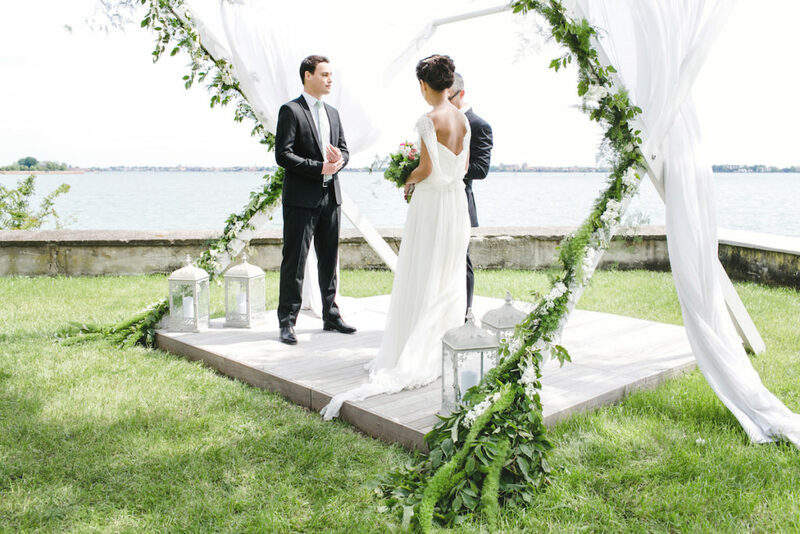 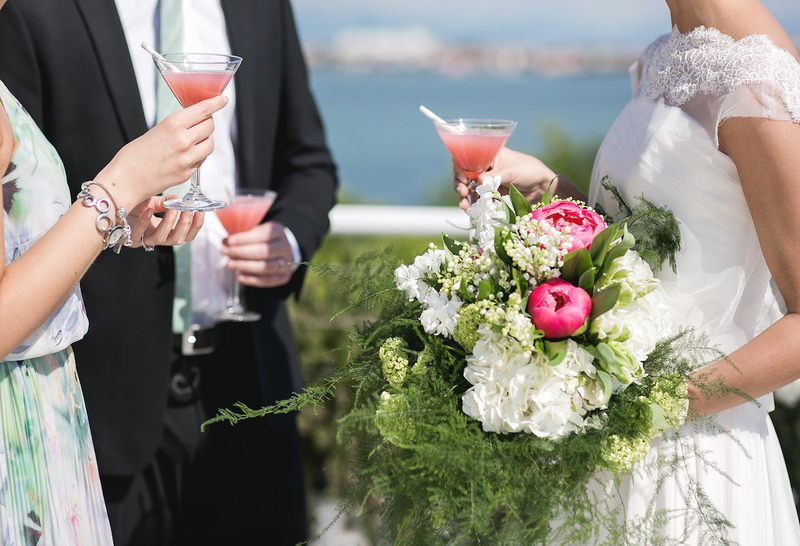 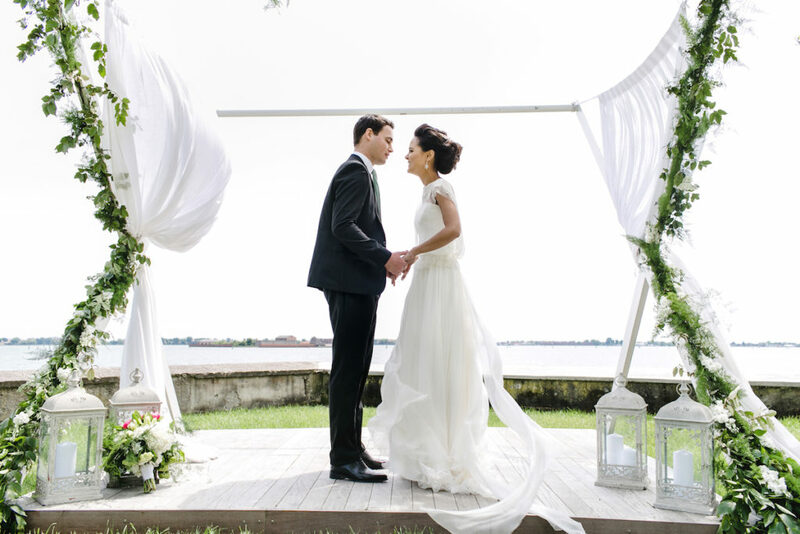 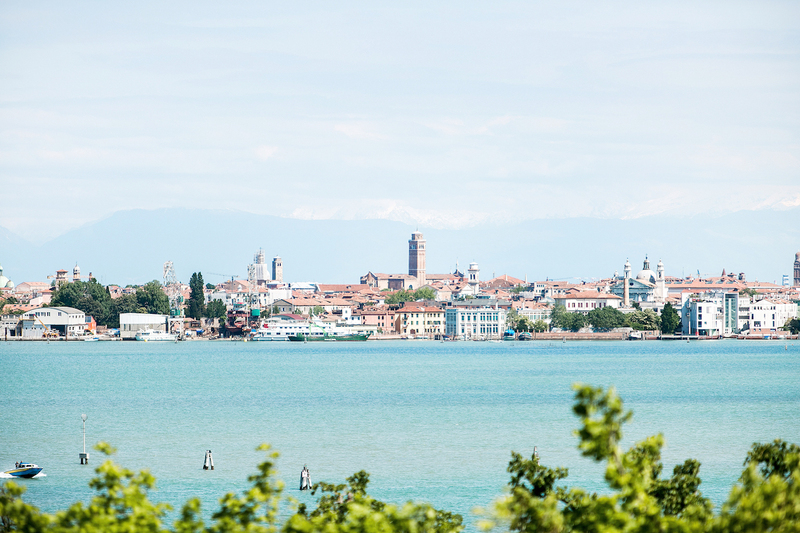 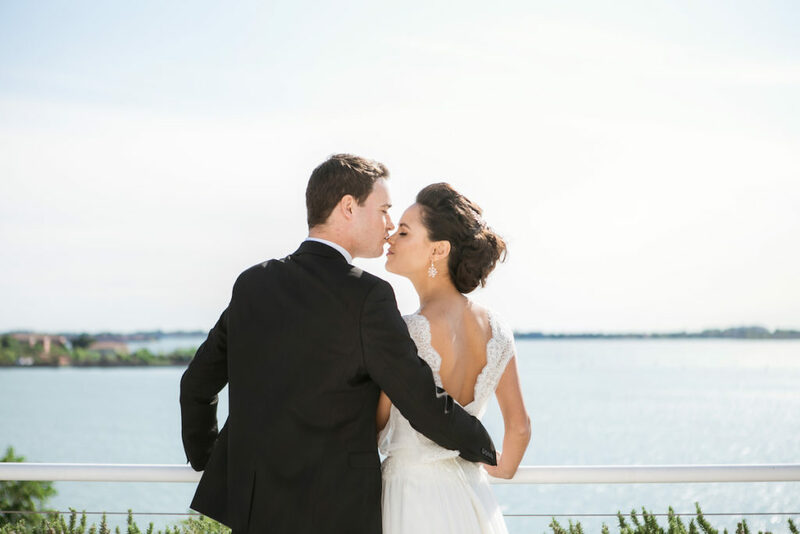 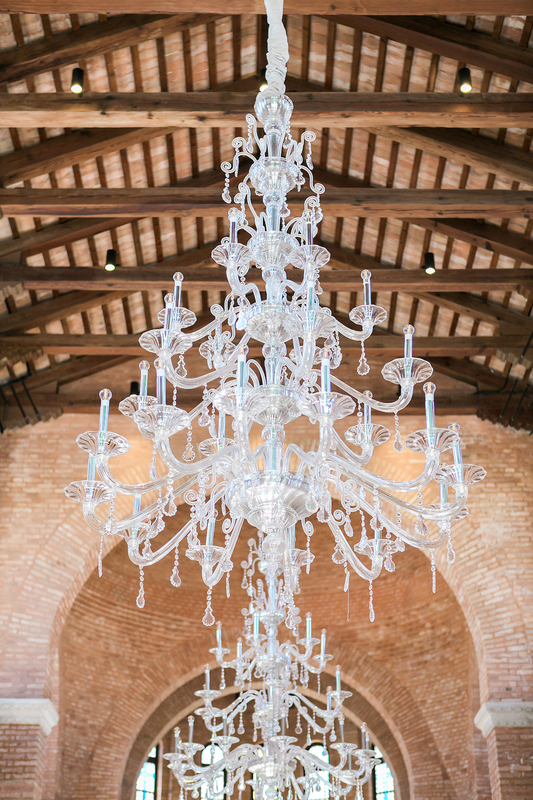 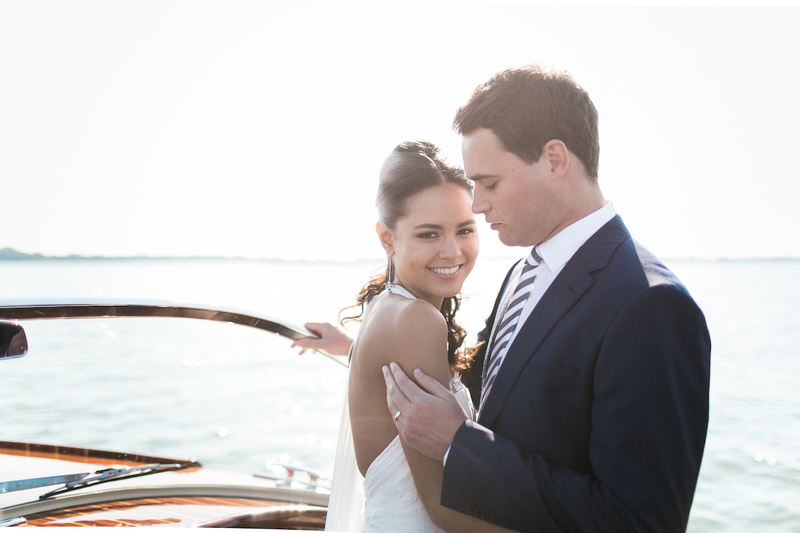 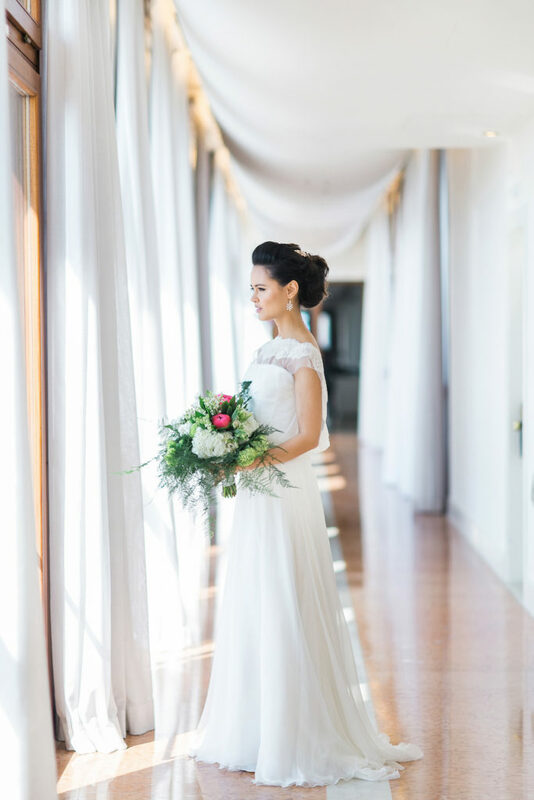 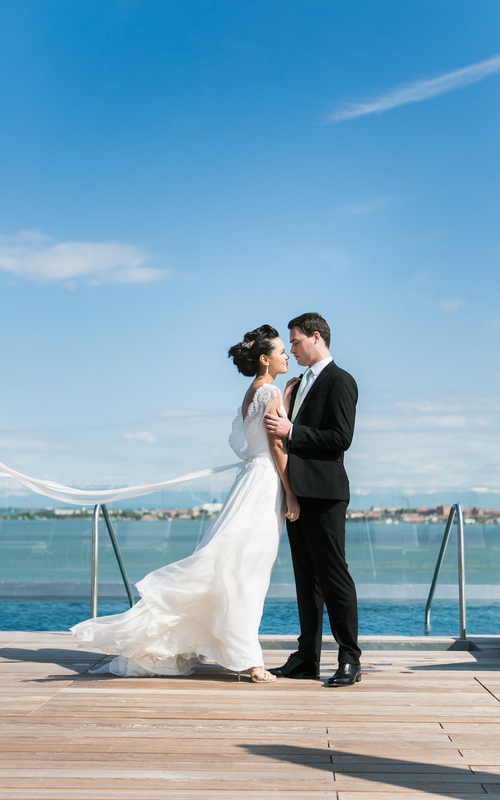 The JW Marriott Venice Resort & Spa served as the perfect backdrop. 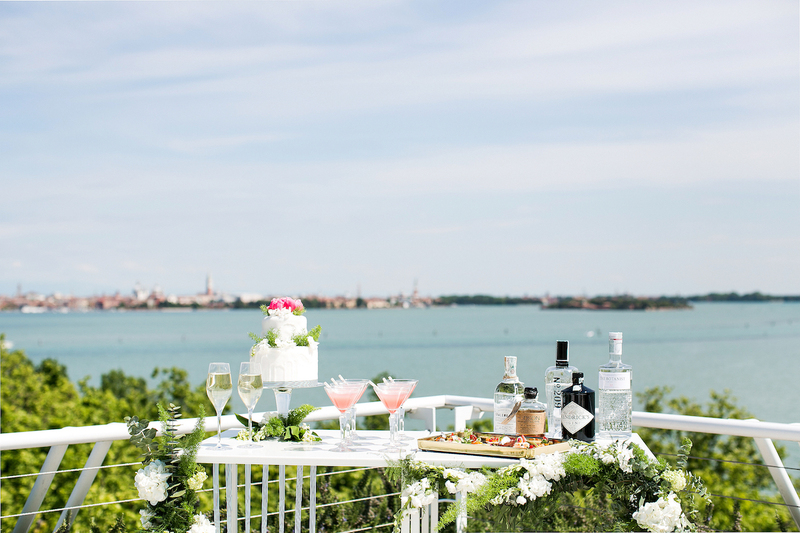 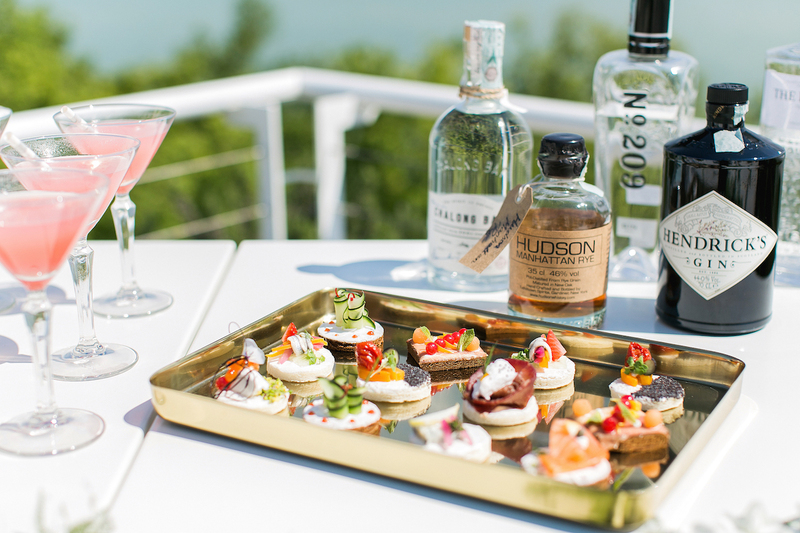 On its own private island (“Isola delle Rose”), it’s the go-to place for discerning travellers, but it also offers the kind of spaces that beautifully matched the vision for this intimate wedding inspiration: a secluded garden with views of the lagoon for the intimate ceremony, a rooftop pool looking out to San Marco Square for a cocktail and cutting-of-the-cake moment, and the most breathtaking reception space in the form of a converted church. 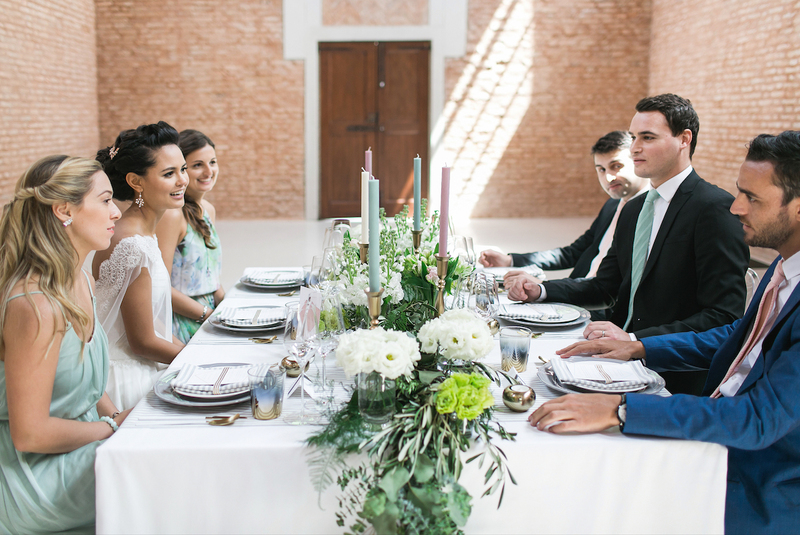 I love the versatility of this resort – it speaks to modern couples and to passionate travellers, while offering the level of intimacy and exclusivity that this kind of couples crave for. 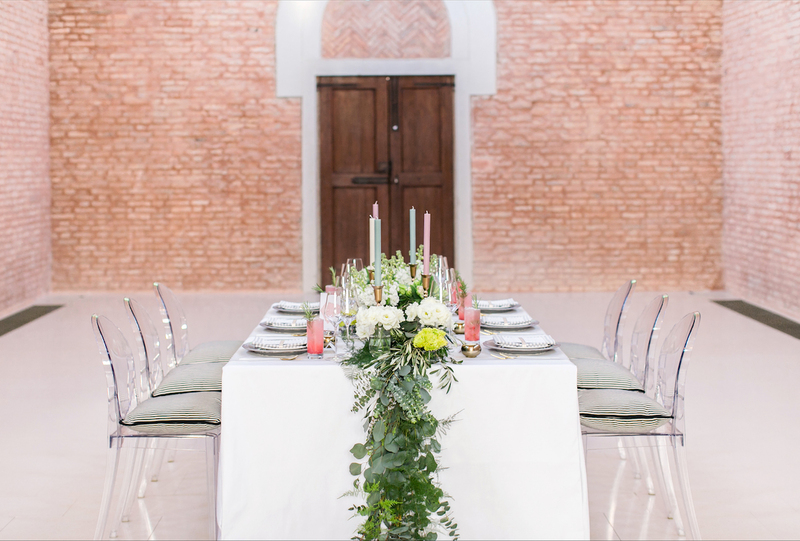 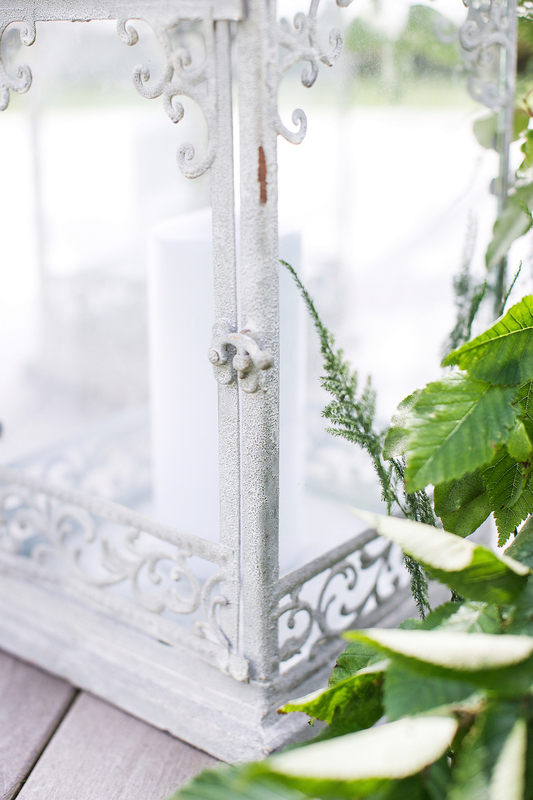 The white and green flowers and trailing foliage on the reception table are key to soften what could otherwise be quite a sharp theme. 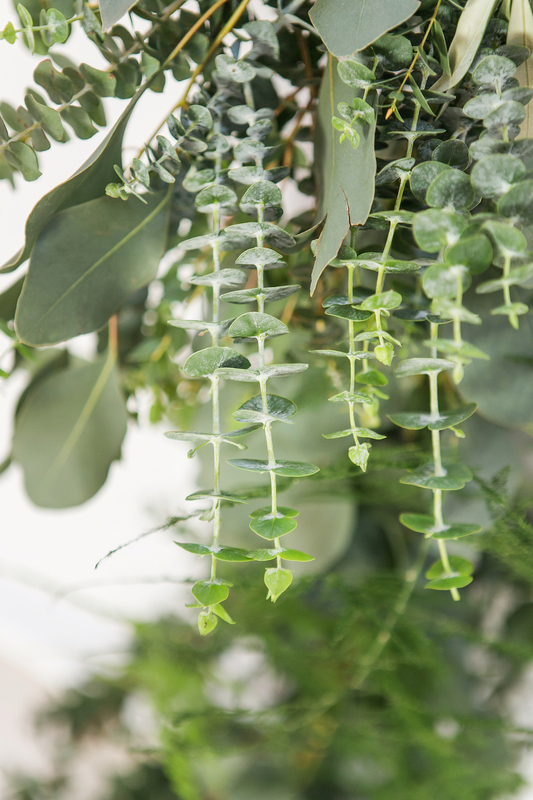 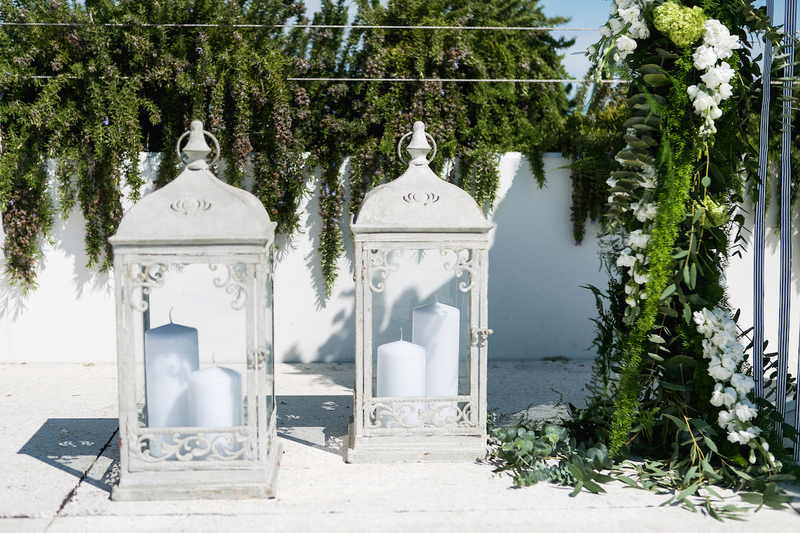 We carried this concept through our ceremony styling too – lots of trailing foliage and white blooms to give such a momentous occasion the luminous spotlight it deserved. 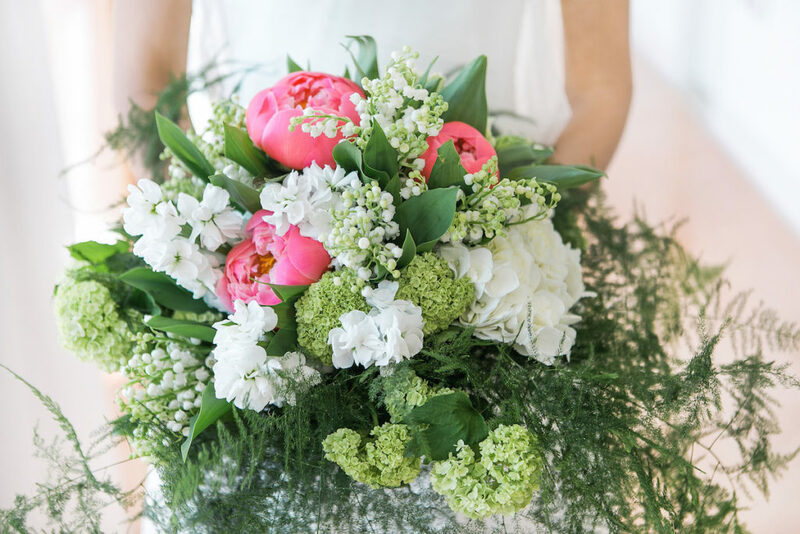 Florist Federico of Centro Fiori injected some colour in the bouquet, by adding to the white and green palette some beautiful bright pink peonies. 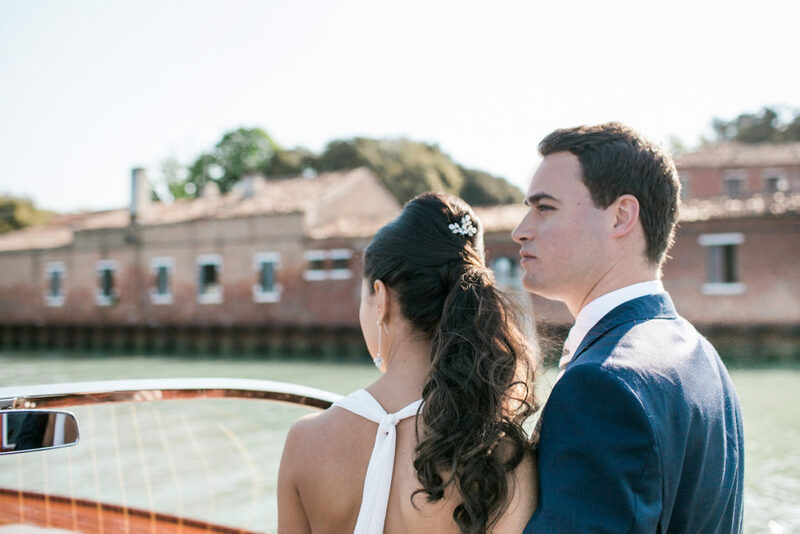 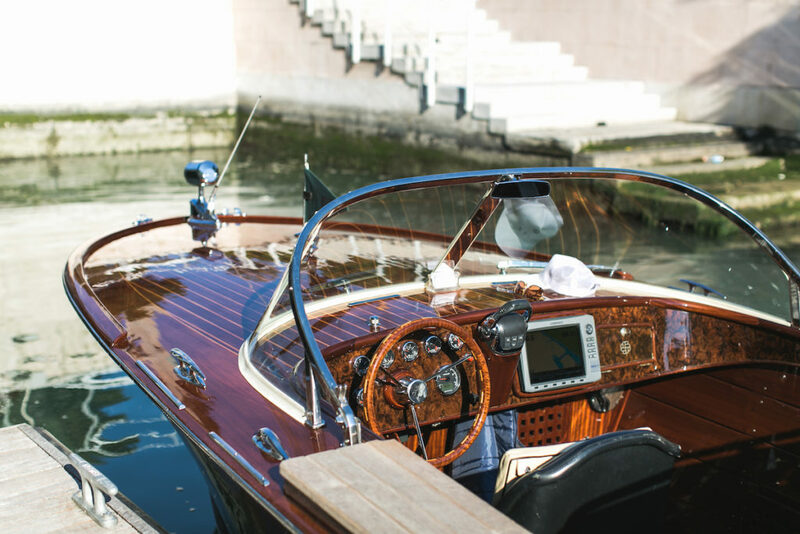 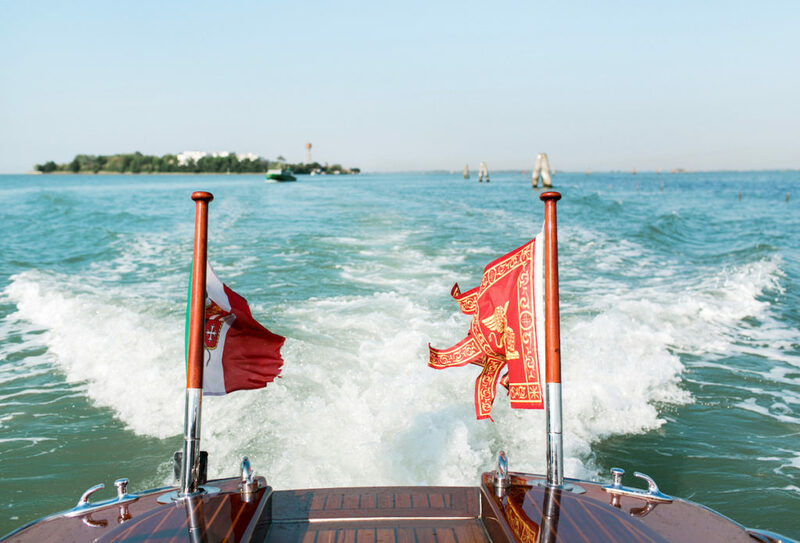 One of our favourite experiences was the Blitz Exclusive water limo journey into San Marco Square – for a stylish couple choosing Venice for their wedding, you simply cannot miss the opportunity of ‘strolling’ through the canals with the only luxury water limo available in Venice! 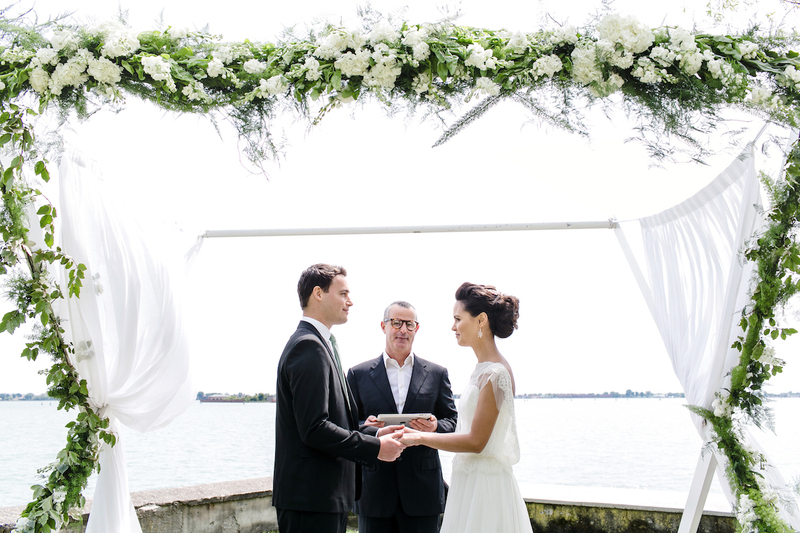 It felt like a celebrity moment and one our couple loved the most.